In the last few weeks we’ve held two excellent meetings as part of what we call our Primary Transition Forum: one for English; one for Maths. They’ve both been incredibly interesting, useful and eye-opening. There is so much to learn; so much we don’t know about what goes on on the other side of the KS2-KS3 chasm. It’s something I go on about all the time – the extent to which teachers from primary and secondary sectors are segregated in their professional lives. The one teacher – one class primary model contrasts so sharply with our highly specialised multi-teacher secondary model and, arguably, the skills and dispositions needed to span the range from Y7 to Y13 are very different to those needed to span from Reception to Year 6. We’re different. But not THAT different. 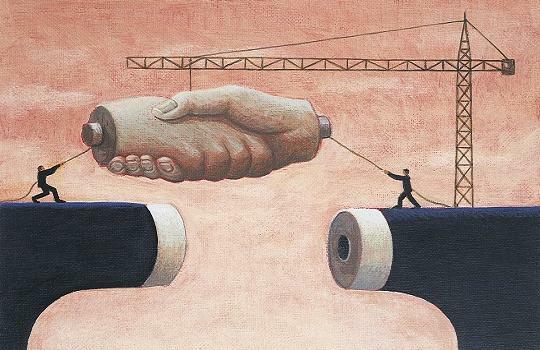 Given that our students progress from one domain to the next ever year and occupy space in the same community, and that the curriculum has so many common components, it’s ridiculous how little contact teachers have with each other across the divide. We wanted to change that. Last November we ran our first Transition Forums to explore how useful this could be. Our conclusion was that it is something we need to sustain as part of our routine engagement with our feeder schools; the meetings are part of a process, not one-off events. That’s the goal. We’ve been able to engage in discussions about pedagogy and curriculum that have been amazingly rich both in terms of information sharing at a time of change and in terms of a deeper understanding of pedagogical sequencing and standards. Our Maths forum included teachers from five primary schools and about four HGS staff; the English forum was attended by staff from two feeder schools and three of us from HGS. From our perspective, we’d learn a lot from just one school but with more you get a sense of the range of practice between schools; they have a great deal in common although some seem to be more confident with pitching the content higher earlier within KS1 and KS2. It’s exciting working with someone like Tanya Watson, Head of William Tyndale Primary School in Islington, pushing the standards agenda with great drive and passion and showing what can be done. Our challenge is to take her students on with the same level of drive so they don’t experience a gap at all. The end of SATs and the new tests coming in from 2016. Primary colleagues are still finding out about the precise structure and content of these new tests. The general trend towards teaching more difficult concepts to younger children. KS2 colleagues were repeatedly telling us that a certain topic or concept used to be in Y6 but is now in Y4; Y4 content is now beginning in Y2 and so on. We discussed how this ‘raising the bar’ process works in practice and the likelihood that cohorts may stretch out wider as higher KS1 attainers progress faster whilst lower KS1 attainers continue to wrestle with more basic concepts. The floor might rise but might the range also expand? That’s something we need to anticipate. The general pattern of ‘dips’ between years. There is a summer break factor and a peak performance factor between all years – even within primary schools from year to year. The Y6-Y7 transition needs to take account of these factors; examples of best work will be a useful guide to peak performance but the need to gear up is inevitable. We need a balance of consolidation and pushing on so that students continue to experience stretch and challenge – but we need to consider stretch through breadth, depth and mastery within a topic as well as moving on to new concepts. Removing levels will force us (happily) to consider the transition in terms of content and work samples and not the levels… that tired old process of casting doubt on the validity of the assessment in NC levels will go. However, secondary staff will need to learn the ropes with the new scale so that it makes sense relative to the way students’ aptitudes manifest themselves in our context. There was enthusiasm from primary colleagues for the Learning Ladders software that facilitates tracking of assessment in highly adaptable format. Over time we will need to engage in routine moderation activities between KS2 and KS3, especially with writing. the new emphasis on aritmetic in general; the ‘how do you know?’ questions are less prominent; questions are more purely arithmetical and abstract with long sections of the new tests given to this. the use of concrete resources such as dienes blocks seems to fade out prematurely. We all agreed that we needed to focus on students’ concrete understanding of number, building stronger mental models and that concrete resources can support learning for students at all levels. 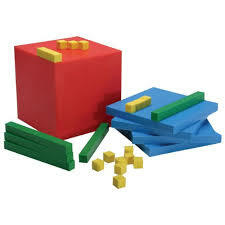 Dienes blocks. Image via Amazon. the concept of proof and ‘show that’ questions. This is coming into KS2 more strongly. a range of specific areas where less confident children struggle – eg with times tables – as discussed in this earlier post about mental models in maths. spiralling, marking and feedback and the need to have a good understanding of the next steps children need to take rather than always moving them on to new material – different ways to move sideways as well as forwards. We exchanged books and curriculum plans; showed our text books and assessments and agreed to trial a process with one of our feeder schools whereby all the children bring us their most recent Year 6 maths book in September. We will evaluate how useful this is by looking at the books over the first few weeks of term as we get to know our students. Atomised responsibility for writing: At KS2, the one teacher- one class model creates the environment for writing to be developed across a range of genres with a common and coherent focus on standards of writing, grammar and so on. At KS3, this responsibility falls too heavily on the English teachers who don’t see their students as much; we need to work harder to develop a shared sense of responsibility for writing across departments with stronger common standards and a shared understanding of the expectations we have of students. Exemplars are key. Descriptors are problematic. We looked at some Islington exemplars for expected writing in Y5 and Y6 and exceeding Y6. These were ‘published’ pieces – ie based on scaffolding and redrafting. The standards are high; the exemplars showed some highly sophisticated structures. The issue of meeting all or some of the curriculum objectives to meet a standard; some primaries are going for All – but that’s demanding. Examples of bar raising: the use of apostrophes for possession being taught in Y2; the expectation of ‘convincing metaphors’ in Y5/6 – as opposed to any metaphor. Authentic vs forced writing. The notion of ‘fake it to make it’ – ie many children need to use structures that are unfamiliar and unnatural relative to their normal speech prior to adopting them more instinctively. This can lead to writing feeling forced. There is a maturation process with writing – authenticity flows with it – but children can be taught to use the structures earlier. Are authenticity and maturation fundamentally inked to frequency and breadth of reading? At William Tyndale, they’re placing more emphasis on reading now, having worked a lot on writing; reading in a ‘forensic’ style to tease out the structures and vocabulary – alongside reading for pleasure. Does topic immersion generate better writing? As the content is richer, children appear to be more naturally inclined to include it in their writing and, crucially, they focus on drafting specific pieces of work for longer. This is more possible at KS2 through topic based work where literacy and content inter-link; it’s an issue for us to consider at KS3. eg in History, linking content to the quality of writing in a 3 hour per fortnight cycle is more challenging. The terminology of grammar. This is not even firmly understood by teachers or used consistently from KS3-KS5. eg articles vs determiners. (an article being just one type of determiner). Reading recovery/acceleration. At primary school, one-to-one reading and guided reading are routine in some schools depending on students’ needs. One school sets 30 mins reading homework per day. At HGS our resources are possibly spread too thinly. Should we focus on fewer students so they get more intensive one-to-one reading support every day? Should we do even more to develop a culture of reading, again not just focused on the English department. Guided reading methods: the role of the questioner, summariser and so on – something more KS3 teachers could do. I haven’t captured everything here. We covered a lot in 90 minutes. We’ve agreed to trial the process of asking our new intake to bring with them at least one piece of ‘published’ writing to show us what they can. I love this idea of publishing – of writing up best work. If we have these reminders stuck in books, teachers and students will have concrete information about baseline standards in Year 7 to refer back to. We’ve just started this process. We all expressed a commitment to continuing with it in the long-term. Our next Forum will be held at one of the primary schools. In looking into this area I’ve found this resource from Michael Tidd @MichaelT1979 incredibly helpful. I’m going to make sure my staff have a copy. Click the link to download from the TES site. An excellent summary of the primary curriculum by Michael Tidd via TES Resources. « Festival of Education 2015: Ideas, people, emotions. #PassOut. I’m in awe! Years of trying to work on transition and I’ve never seen anything so coherent emerge. Credit to your network of schools.I’m overjoyed if the jigsaws are helping to foster understanding between the two sectors. One slight side: where did the thing about ‘convincing metaphor’ come from? That doesn’t feature in the primary Writing curriculum, certainly. Thanks Michael. I’m super conscious of the transition in my area. I’ve got a lot of families who ‘go private’ after good state school KS2 experiences and I need to show them that they’re wasting their money! ‘Convincing metaphor’ was part of the discourse reported around the ‘exceeding’ exemplar for Y6. A feature of authentic sophistication; an implied criterion perhaps. Ah yes, know of similar things in other areas – particularly those with middle schools where transfer to upper coincides with starting point for 13+ independents. This is a fascinating summary of work on this much neglected area. As an ex-Head of English, who now works in primaries, I have spent a lot of time thinking about how we can improve transition. I was particularly interested in the primary colleagues’ observation that the range of range of attainment will widening with the new NC. In my experience primaries tend to differentiate a lot (mainly in terms of task) more than we did in my department – and dare I say ‘growth mindset’ is not generally acknowledged. I think if more primaries used Alison Peacock’s Learning without Limits philosophy they would find that a widening range of attainment within the class would not be such a issue. I have also seen amazing ‘topic’ work, where the pupils’ writing has been of a very high standard because they have had time to immerse themselves in a topic. We really are missing a trick at secondary when we don’t plan cross-curricular projects. Finally, I agree with Michael, ditch the obsession with similes and metaphors at primary level. Thanks Laura. The widening is actually my prediction – not yet an observation from primary colleagues. It will be an issue for secondary; top end rising but still students at lowest end coming through albeit in smaller numbers. Read this with interest.We at Kings Priory are in the enviable position of creating an all through school from a previously outstanding primary and a private school. We have been, and are having, very much the same conversations. Meetings take time, some are planned in, some are on the hoof, but are so productive. The dialogue around learning is building and a shared understanding beginning to develop. As Hattie found, collaboration has a really important impact. Only today I came across this entry on your blog. I am your Twitter follower and a careful reader, but somehow missed this one. I am responsible for assessment in KS3 at my school (large secondary) and apart from developing a successful system without levels I want to focus on transition between KS2 and KS3. Over the last two years as an SLE on assessment I have worked very closely with senior leaders from several primary schools, first through a working group on assessment without levels and then I led an assessment focus group. Both groups gave me a better and invaluable understanding of how assessment works in KS2. Fascinating experience, but I struggled to engage teacher from secondary schools. So as soon as I have been given a responsibility for assessment in my own school (the beginning of this term) I have started searching for good ideas on how to develop a link, a bridge between KS2 and KS3. I recently tweeted about KS3 being in the shadows of education, because that’s how I feel about it. One of the reasons is a lack of sensible and effective transition focused on curriculum, not just passing on pastoral information or data from SATs. There is a fundamental lack of continuation and trust among teachers, which is causing so much wasted time in KS3. I think the idea of forums is fantastic and I am so pleased that I have found your comments, which I am going to use to build an effective transition process. I think a very clear focus and plan what teachers talked about in both groups is a fantastic way to support students learning especially in Y7. I look forward to some more updates on how the forums are developing and maybe some feedback on how they are contributing to more effective teaching and learning in KS3 at your school. Thanks Chris. We are about to appoint a Head of Key Stage 3 – at Deputy Head level. A key role will be plotting the flow of curriculum and assessment from KS2 to KS3. A recent local authority visit gave us the impression that KS3 is the new focus for inspections in general; I think schools will be driven towards stronger emphasis on KS3 which, in turn, will stimulate a lot more transition activity. That’s got to be a good thing. Let’s keep each other posted! Thank you for your reply. It would be great to stay in touch and maybe, some time in the future, to learn something from you school’s experience how to plot a smooth transition between the KS2 and 3. I look forward to your posts and tweets. Regarding your recent post on evolution. As part of my job I am also a Head of RE who thinks teaching evolution is important. We look at creationism and scientific approaches to give our boys a broad perspective and open their minds to a variety of realities and questions that people want to find answers to. An open mind approach which should be encouraged in education to lead to informed choices and decisions.